These oat biscuits, very popular overseas, are based on the American tradition, where they are present in a thousand different variations, from the simplest to the richest and most elaborate ones. Obviously you can indulge by trying many different combinations and also varying the proportion between fruit and cereal flakes. Pre heat the oven to 170-180° c.
Blend or mash very well, with the prongs of a fork, the flesh of the banana and mess it up with corn flakes. For the cookies of the photo I added a few drops of dark chocolate. When the mixture is well blended and smooth, cover the pan with parchment paper and place on it the mixture with a spoon. Bake for 15-20 minutes, until the cookies begin to brown on the surface, but taking care not to let them burn (bake more or less depending on the oven you have). It is better to eat them quickly for both the content of fresh fruits (bananas), either because they tend to harden over time. Optional ingredients can be added and changed at will: If you use the dried fruit, cover it with a cup vegetable milk (before soaking cut into pieces the larger one, such as figs or apricots), while if you use dried fruit you can add it directly to the dough, even reduced in grains for a more uniformly crisp. For the chocolate version, you can add to the mix a few drops or flakes of chocolate and cocoa powder, to make them even more "chocolately". 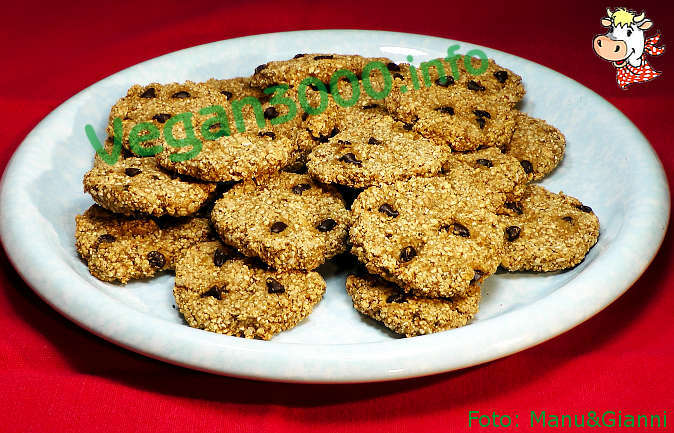 In these cookies the sweetness is the banana, which also serves as a binder, and to some extent from fortified milk plant: from that of rice, or by the addition of agave syrup or brown sugar in case of another vegetable milk. Una ricetta simplice e una ottima opzione per aggiungere a una dieta .